Can you have good grades, a social life, AND sleep? Let’s just call it my worst semester ever. My extensive coursework, work in a research lab, extracurriculars, desire to exercise at the rec center at least 4 days a week, and barely there social life pushed back my sleep to a mere average of 3-4 hours a night. No joke. It even had a hashtag on twitter, #sleeplesssemester. Sure I started drinking espresso straight, using my shot glasses for shots of espresso rather than alcohol, but still I was able to stay up late at night, sleeping on the couch for just 15 minute naps then continuing with my work. Now I try to stay up late, but those 15-minute naps on the couch often turn into hours and when I finally wake up, I realize it’s time to simply go to bed. I miss having those extra hours to be productive while the world slept. This leaves me wondering how can I do it again? 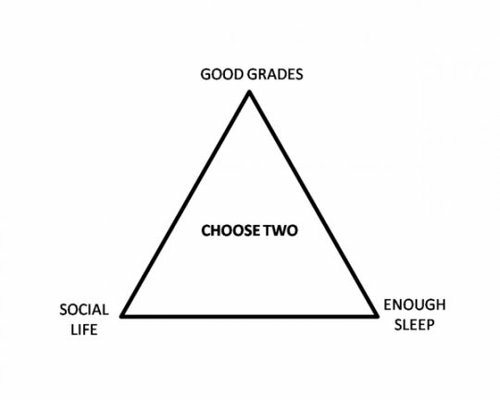 As usually said with the pyramid above, “Welcome to college, you can only pick two.” Prioritizing grades and a social life, it is generally known that the college years are those of likely little sleep, or at least little sleep when it is most appropriate – staying up late to finish school work just to have class early the next day. Coffee, pop, and energy drinks can only help us stay awake for so long. We find sleep when we can in the midst of our lives, but far too often it is sacrificed. Instead, we use our time to master knowledge for our classes, but we forget to master the most important lesson – how to sleep effectively. Not all sleep is equal; this is easy to forget. When you sleep, you’re not like a battery being charged at a constant rate. How well recharged you feel and how easily you can wake up is dependent on the length you sleep as well as how well you sleep and the consistency of your sleep pattern. Back during my #sleeplesssemester, I got in a habit of going to bed at 3-4 am and getting up at 6-7 am each day during the week with just a little fluctuation. Now that I work overnight shifts, some nights I sleep 12am-8am, some I sleep 6am-10am, and some I sleep 7:30pm-3:30am (like last night… oops!). This inconsistency makes it hard then to wake up in the morning, which is one of my bigger struggles of the day and makes it very tempting to skip class or go in to work later. Also back during my #sleeplesssemester, I studied on one couch but I slept on another, but in my new apartment, I now nap on the same couch that I study. It is said to help people fall asleep at night to only use the bed for sleep – no studying or anything else in the bed. Perhaps that can go the other way as well to say ONLY sleep in bed. It may be hard to do when tired and the couch is so convenient, but it helps remove the association that it’s ok to stay asleep on the couch for long periods that could result in 15 minute naps turning into hours. Sleeping on the couch for so long also gets me into deeper sleep than the 15 minute naps that I intend. After sleeping for hours on the couch and going through the sleep cycle, waking up at some point in it and having to then get ready for bed, climb into bed, and fall asleep again disturbs the sleep cycle making it much less effective. It is as if that time spent sleeping on the couch did nothing to help me feel more rested. It seems counterproductive to focus on sleep when trying to figure out how to stay up later. But from noticing my sleep habits, I now know of ways that I can try to sleep more efficiently so that I can be able to stay up late when I want to. Only sleeping in my bed, napping on a different piece of furniture than I study, realizing when I need sleep and actually going to bed, trying to wake up at a consistent time each day will all hopefully help me feel more rested and will help me get the time back in my day that I want. Mastering sleep can begin with acknowledging the faults in your sleep schedule and figuring out how you can fix them. Each person is different and so it may take some trial and error to figure out what works best, but being more aware of your sleep patterns and sleep quality can help improve your sleep efficiency, your energy level, and your overall productivity level. In turn, this can help you reach a little closer to the sleep corner of the triangle without having to sacrifice good grades or a social life! Yes you don’t have to just pick two! Update 2/5/14: I am now in a combined MD/PhD program and I no longer work random overnight shifts. This previous summer, I went cold turkey on my caffeine addiction and focused on sleeping more each night. While my daily cup of coffee routine has returned as a student (because I originally started drinking coffee simply because I like the taste of coffee), I am sleeping 7-8 hours every night and I haven’t felt so awake in many years! While I have a lot on my plate currently, I have found that getting extra sleep hasn’t affected my ability to get everything done at all, in fact I feel that it has helped immensely!